It is a sad and very melancholy scene, which must strike everyone who knows and feels that we also have to pass one day through the valley of the shadow of death, and que la fin de la vie humaine, ce sont des larmes ou des cheveux blancs. What lies beyond this is a great mystery that only God knows, but He has revealed absolutely through His word that there is a resurrection of the dead. What am I in most people's eyes? A nonentity or an eccentric and disagreeable man... I should want my work to show what is in the heart of such an eccentric, of such a nobody. If you saw the first painted color studies that I made when I came here to Nuenen  — and the present canvas  — side by side — I think you'd see that as far as color is concerned — things have livened up. I think that the question of the breaking of colors in the relationships of the colors will occupy you too one day. For as an art expert and critic, one must also, it seems to me — be sure of one's ground and have certain convictions. At least for one's own pleasure and to be able to give reasons, and at the same time one must be able to explain it in a few words to others, who sometimes turn to someone like you for enlightenment when they want to know something more about art. I want to do drawings which touch some people... In either figure or landscape I wish to express, not sentimental melancholy, but serious sorrow. No blue without yellow and without orange, and if you do blue, then do yellow and orange as well, surely. Let us keep courage and try to be patient and gentle. And let us not mind being eccentric, and make distinction between good and evil. To stick to the present and not let it pass without drawing some profit from it, that's what I think duty is....let us perservere as far as we can rather today than tomorrow. That is my ambition, based less on resentment than on love in spite of everything, based more on a feeling of serenity than on passion. Variant translation: It does not matter if I feel a terrible need for religion. That is when I go outside, into the night, and paint the stars. / Another variant: When I have a terrible need of — shall I say the word — religion. Then I go out and paint the stars. If we study Japanese art, we see a man who is undoubtedly wise, philosophic and intelligent, who spends his time doing what? He studies a single blade of grass. We feel lonely now and then and long for friends and think we should be quite different and happier if we found a friend of whom we might say: He is the one. But you, too, will begin to learn that there is much self-deception behind this longing; if we yielded too much to it, it would lead us from the road. Oh, Theo, why should I change — I used to be very passive and very gentle and quiet — I'm that no longer, but then I'm no longer a child either now — sometimes I feel my own man. There was a sentence in your letter that struck me, I wish I were far away from everything, I am the cause of all, and bring only sorrow to everybody, I alone have brought all this misery on myself and others. These words struck me because that same feeling, just the same, not more nor less, is also on my conscience. 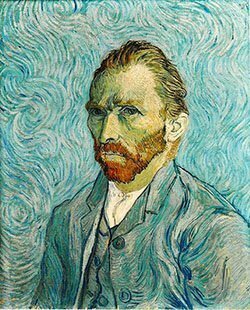 Bio: Vincent Willem van Gogh was a Dutch post-Impressionist painter whose work had far-reaching influence on 20th-century art.